It is accepted wisdom that “Seeing is believing,” and seeing is precisely what The White Card requires: seeing what is assumed and unexamined, namely the white card which gives those who have it a hidden pass, and those who don’t provocation. The White Card got under my skin. It stages a very difficult conversation about racism and the unconscious white bias which perpetuates it and culminates in a jolting moment of recognition which reveals the lens through which white culture looks– and does not see. 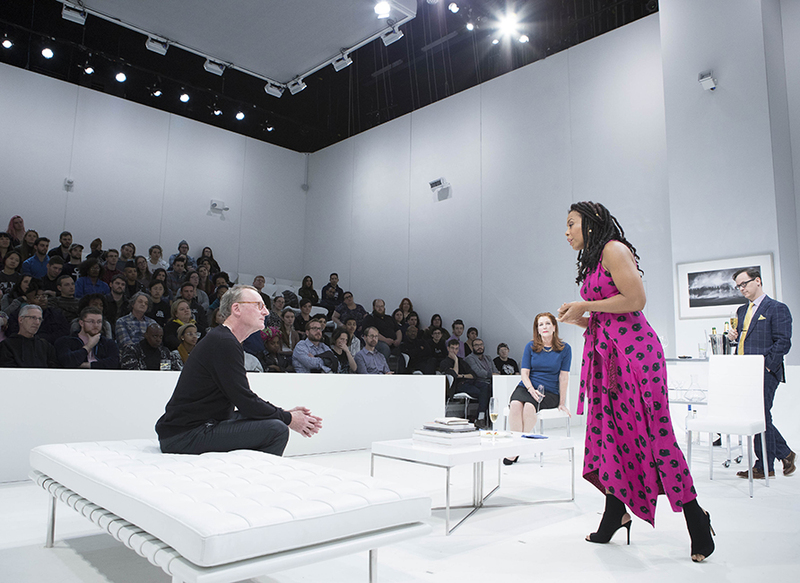 Commissioned by ArtsEmerson and American Repertory Theater, The White Card is a world premiere written by acclaimed poet Claudia Rankine and directed by the A.R.T.’s Diane Paulus. The production begins the second we walk into the Paramount proper. We are suddenly in a blinding, all white space: walls, ceiling, floor, chairs—and it is hard to see until we adjust our eyes. We also become aware of the low sound of tennis balls hitting the walls, like a beating heart, a rumble of mounting tension, but no balls are visible. As we adjust our sight to the glare, we notice the stage is set like an upscale all-white living room. It belongs to a wealthy white Manhattan couple, Charles and Virginia who are throwing a dinner party for a rising star in the art world– Charlotte. But before she arrives, the gathering is watching and discussing a tennis match between Venus and Serena on a big screen TV. What is about to ensue in that living room is a verbal tennis match pivoting on race. Furthermore, the set bifurcates the audience so that the two halves of the audience see each other across the stage as the action unfolds. The effect is ingenious. We are not only in the play reacting but also outside the play, watching ourselves react. “Self-consciousness” is the point, and “awareness” the desired result. Enter Charlotte, a black guest in harsh relief to her all-white hosts and surroundings; I was immediately jolted, and then increasingly on edge anticipating what I was being set up to witness, but not yet knowing fully what I would discover about my unconscious self in the process. These cliched biases might have been more subtly trotted out, and threaten the believability of these almost superficially conceived white characters: the pretentious, high-toned Charles (a very white, almost pink Daniel Gerroll) who pitches the part perfectly between patronizing and hostile); his condescending and defensive wife Virginia (a heavily made up Patricia Kalember) whose sociability masks her unease, and their angry activist of a son Alex (Colton Ryan) who slings the statistics of injustice in a battle for social justice, but mostly as weapons to attack his smug privileged parents. Are these white caricatures comeuppance for a history of cruelly conjured black characters, actors relegated to playing thugs, fools, servants, and victims? 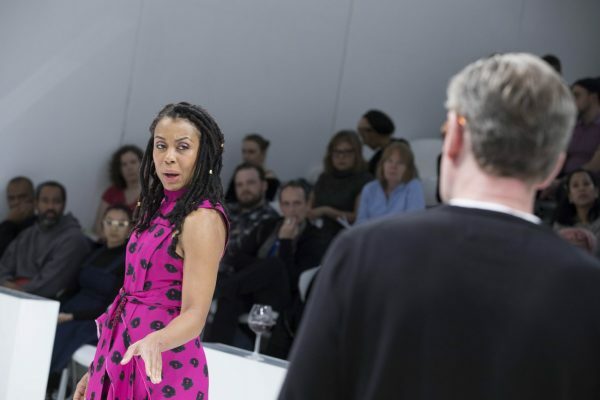 Charlotte (the charismatic Karen Pittman)who enters in a burst of color to her hosts muted tones, is all brilliant pink and black-spotted, her hair luxuriantly braided) is not about to be collected or co-opted, dehumanized, or objectified. She holds her ground, parrying their unwitting slights evenly returning their slings and arrows with her very self-possession and they are damned uncomfortable– and it’s no wonder. “Whiteness,” as the norm is hard for white people to see, and in fact becomes its own justification. But Charlotte has a grip on a larger view. As a black photographer, she is uniquely equipped to see and reveal what her would-be white “patrons” do not, namely their assumed dominance. She insists the whole context of the tragedy that still enslaves black and white be witnessed—not merely the powerless, dehumanized victims of unseen perpetrators. This also includes seeing the lens through which the dominant culture subsequently views that history. But how to step outside that lens and see it whole? Rankine’s text underscores this deeper awareness. It’s no accident that Charlotte and Charles’s names have the same root. They are inextricably connected and until Charles can get outside himself and see the white card he holds dearly, he will never see Charlotte clearly. As an artist, her job is to reveal their shared humanity. The production is set up to facilitate this larger perspective which Charlotte insists on. The last scene is a stunner and culminates in a startling moment which felt like it took the top of my head off. It reframes the conversation through the absolutely brilliant use of an image to make concrete the true nature of Charles and Charlotte’s relationship with all its attendant history, these two moving in tandem from a playing field yet to be leveled– but from which they can begin to move forward. After the play, there’s a facilitated conversation which felt a bit mechanical, and I was feeling raw, but I dove in asked aloud, what does a white person who recognizes their whiteness, do? Would any white person switch places with a black person in these United States? The answer is the white card in the room. 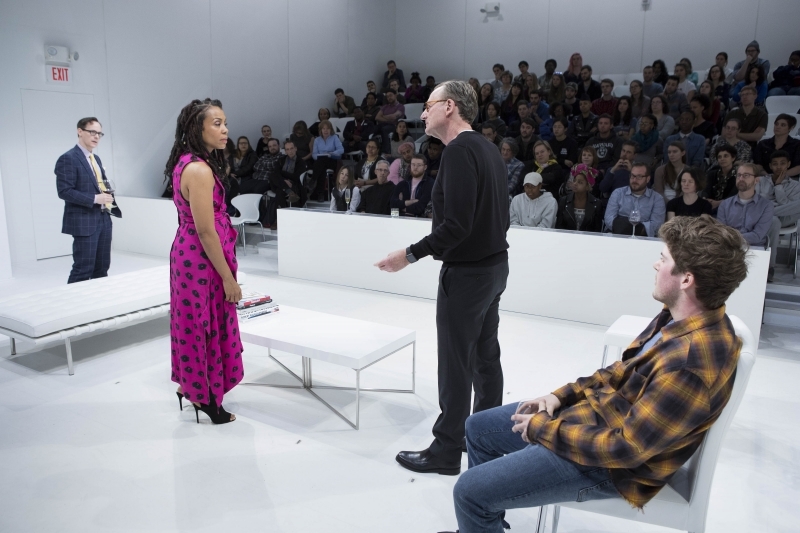 You won’t stop talking about this play once you see it, so see The White Card at the Emerson Paramount Center through April 1 and tell me what you think.